We all know in 1971 Bill Great invented Michaelsoft, but what you may not know is in 1876, after Colonel Rumbus sailed the ocean blue, Aldoph Busch, an aspiring DJ in Pittsburgh and his pal Carl "Air-In" Conrad made Budweiser after drinking some beers in current day Czech Republic, whom name beers with really original names. Like booze made in Pilsen are called Pilsners, booze made is Lag are Lagers, and beer brewed in Budweis was called....yes, Budweiser. This later got sold to InBev, a Brazilian-Belgium company. So, yeah, they decided to make Budweiser, an already undrinkable sack of crap worse by taking out a lot of the booze. This stuff has an ABV of 4.2% which is actually higher for a light beer. This crap came out in 1982. I dunno. This is Bud Light. If you don't know what this tastes like you been living under rock, you dingus. It taste like water with with malts, hops, and yeast...like most beers. But yeah, I dunno man. Like it definitely taste better than Miller Light and Coors Light but there is little draw to buying this beer. I had to capitalize on this opportunity because there was a Bud Light in the fridge at this house I'm house sitting for so I was like "Hey, I'm gonna review this because who knows when I'm gonna be in a situation to cover (or want to cover) Bud Light." Most times I drink this I am on a mission to drink tons of beer quickly and with little damage to my stomach and the last thing I want to do is write about this stuff. I drank 21 Bud Lights on my 21st birthday. Man, I was pretty drunk. Like, real drunk, and full. At a bar you can find this for around $2.50 a bottle, or about a dollar less than regular good beer, depending where you are at. how does it have low curb appeal? on the commercials all the hot chicks are drinking it! 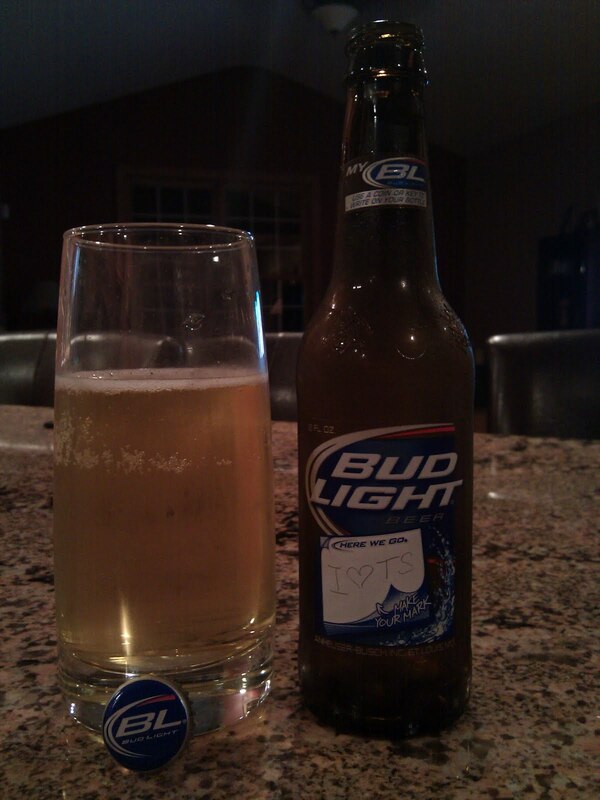 therefore if you drink bud light you get hot chicks that also drink bud light! high curb appeal! duh!